Time once again for the Dividist to stroll down the metaphorical beach of the DWSUWF blog and take note of the detritus that has washed ashore and cluttered this little island of rationality in our great big blogospheric ocean. The news this week has tended toward the apocalyptic. There is nothing like a pending apocalypse to get the blood flowing, veins popping, teeth gnashing, spittle flecked screens, and broken keyboards flying. ITEM - The Government Shutdown Apocalypse is Nigh! OMG! It's going to happen. The Government is going to shutdown for the weekend! Or not. We don't know what to expect. After all, this has never happened before. Well - except for the last 17 times. We just don't know who to blame. It might be the Democrats. It might be the Republicans. It might be the President. Whomever is to blame, we know this is a disaster of apocalyptic proportions. We know it must be of monumental import because all broadcast networks are displaying countdown clocks while breathlessly counting down the seconds until the shutdown apocalypse. We know this must be monumental import because memeorandum has noticed little else. Our only comfort is the knowledge that if there is any way to avert this catastrophe, the reasoned arguments and cool heads of our elected leadership will find that path. This would be funny if it was not so pathetic. Scratch that. It is just funny. The real budget debate lies ahead, but this is a good dress rehearsal. When the compromised answer to cuts in a partial year discretionary budget lies somewhere between cutting $38B and $66B, the Dividist does not honestly care where we specifically finish. It is enough to know we are moving in the right direction. At midnight tonight the Dividist will greet the apocalyptic shutdown with a celebratory drink. 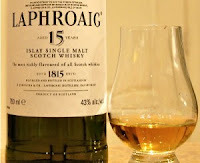 Perhaps a 15 year old Laphroiag poured neat. The Dividist may even have a celebratory shot if the government shutdown is averted. It has been an ugly, contentious, uncivil, argumentative, partisan and polarizing process. 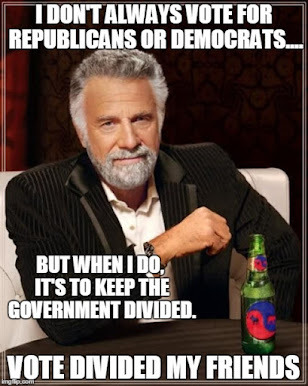 Exactly the way it is supposed to be in a divided government. Exactly as intended by the founders. Neither party gets steamrolled and we are moving in the right direction. The Dividist could not be happier. "The end is in sight. Or is it? At the end of the day, Republican and Democratic leaders were able to get past their barbs and come up with a deal that could keep the federal government renewing passports, refunding taxes, and paying the troops." Either the President caved, or the Republicans caved, but there will be $38 Billion in real cuts. 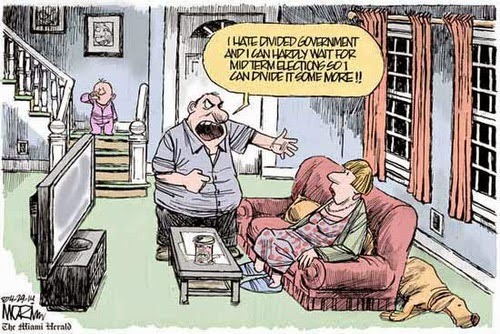 No one seems very happy with the deal besides the Dividist. It's a start. On to the next apocalypse. ITEM - The December 21,2012 Mayan Apocalypse is Nigh! You have to admit - as far as apocalypses go, the budget shutdown is pretty lame. 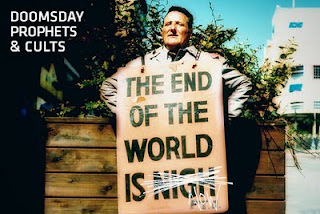 If we really want to indulge in apocalyptic fantasy, nothing less than the 2012 end of the Mayan calendar will do. This week CNBC broadcast a new documentary on the the growing frenzy for the Mayan Apocalypse. Un-friggin-believable. "There's obviously a segment of the population that's drawn to this and it becomes self-perpetuating. There will be products out there to buy. "And there are—running the gamut from doomsday survival bunkers, doomsday last wills and testaments, doomsday vegetable seeds for food shortages and for those needing something to hug, doomsday teddy bears. Many of the doomsday offerings are seeing record sales. That's because there's no shortage of customers, says Bucknell University sociology professor Alexander Riley, who's done research on end of the world scenarios." The Dividist wonders just what these people are going to do when they wake up on December 22, 2012 and it all looks pretty much like it did on the 21st? They're going to need to figure out what to do with the rest of their lives and how to recover from the financial wreckage they've made of their future. They'll need help, financial advice, counseling, maybe a support group, maybe... a web site... maybe... hey... wait a minute... Hmmm. Announcing the 2013 NO BANG? - LET'S WHIMPER!™ SOCIETY. WHAT ARE YOU TO DO WHEN THE WORLD DOES NOT END? WE HAVE THE ANSWERS! Just send us your membership fee, and we'll help you get through the crushing disappointment and post-non-apocalypse depression. Stay tuned! ITEM - Your Quarterly Peter Schiff Financial Apocalypse is Nigh! Yeah I know. We've heard it all before and he has been saying the same thing for the last five years. Sure he was right in 2006 -07, 2008, 2009, and 2010. but this chicken little shtick is getting old. Even if the sky really is falling. The Divdist is just tired of hearing it. Bummer dude. I think I'll have another shot of that scotch. ITEM - The April 27th Ben Bernanke Press Conference Apocalypse is Nigh! "Traders are saying the scariest moment of the second quarter will be on April 27, when Federal Reserve Chairman Ben Bernanke will hold the first ever press briefing following a monetary policy decision by the central bank. This change in the Fed’s communication with the markets alone is enough to give investors the jitters, but the nervousness is compounded by the anticipation of a signal by the Fed chief as to whether the quantitative easing that has fueled this bull market will continue past its stated end date in June.“I think Bernanke wants to continue to ‘QE3,’ but the rest of the Fed does not, and if he has to admit that on the air, it could be the turn,” said Steve Cortes, founder of research firm Veracruz LLC. " "Traders are starting to believe that the most dangerous moment of the second quarter will be April 27. That is when Federal Reserve President Ben Bernanke, will hold his first press conference immediately after a decision on monetary policy. This change in the normal communications between the Federal Reserve and the markets is enough to raise concerns among investors, but there are fears that Bernanke will point out that QE2, the principal fuel of the markets’ rally will end in June." Be afraid. Be very very afraid. Perhaps two more fingers of that Laphroiag. ITEM - The Apocalyptic End of the Apocalyptic Vision of Glenn Beck is Nigh! The Dividist has managed to miss every single episode of Glenn Beck from the first time he appeared on Fox News Jan 19,2009 until his announcement this week that he is leaving Fox News. Nevertheless, the Dividist believes he has seen or heard almost everything of note that Glenn Beck has said or done in his tenure on the show. The reason is that Dividist reads a lot of blogs from both the right and left wing. and there has been a lot of derivative reporting of Beck across the blogospere. Oddly, most of it from the left. The Dividist seldom sees a right-wing blog touting what Glen Beck says. Some on the right even seem embarrassed. But the left-0-sphere cannot get enough of him. Make no mistake, he was an easy target and richly deserved every sling and arrow. Still, this observation leads the Dividist to wonder if the Left repesents a significant percentage of his audience. With the 30%+ slide in Beck's ratings since the election, the Dividist wonders whether liberals are the only audience he has left. ITEM - The "Michael Reynolds still Owes The Dividist a bottle of 15 year old Laphroiag" Apocalypse is Nigh! Really, Mike. I am almost out. This is getting serious. He still owes me a cigar too. Real Montecristo preferred, Mike. The Belgiums survived a long government shutdown. "I Survived...Beyond and Back" has documented life after death. I just don't believe in Apocalypses. I don't understand what the heck is going on in Belgium. It's not so much that they had a government shutdown, it's that their elected parliament cannot field a majority coalition - so they continue to operate under the previous caretaker government. During that time they apparently also successfully completed their term as the rotating EU presidency, without a government of their own. Too complicated for me, but it does beg the question whether they even need the new government. Maybe it'll never be seated and they just return to a monarchy. Whatever. Yeah - Apocalyptic reporting will with us always - It is just more entertaining reporting on an apocalyptic government shutdown than reporting on yet another episode of a completely expected political brinksmanship exercise resulting in a predictable compromise.